It’s March — the most unpredictable weather month of the year. We’re all familiar with the old saying about March coming in like a lion and going out like a lamb, or vice versa. But, which is it? Sometimes the answer is not so clear. Last night we had a discussion about whether, in central Ohio, March was coming in like a lion or a lamb. The temperature was at freezing levels, with snowflakes blowing down. I took the position that March had come in like a lion. The alternative view was that 32 degrees and a little snow wasn’t that bad, and that you could only invoke the lion if the weather was abysmal — temperatures in the teens, raging blizzards, and so forth. That seems like an awfully high leonine standard to me. It’s just a lion, after all, not Godzilla or Darth Vader. So, I’m going with the lion. 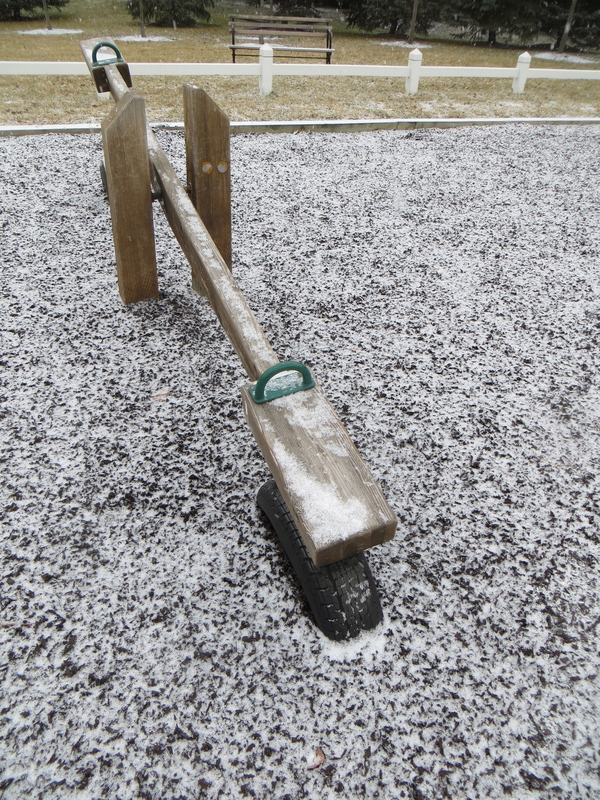 If March had come in like a lamb, it seems to me, there’d be kids on the seats of the teeter-totter at the neighborhood playground, not swirling snowflakes. As I’ve mentioned before, I am all in favor of increased recycling and minimized use of landfill space. I zealously recycle cans, bottles, plastic, and paper items. So, I was happy to see that our neighborhood playground has done its part by using shredded rubber tires to spread under the swings, teeter-totter, and slide. I discovered the recent addition when I walked past with the dogs, and noticed a distinctly springy feel underfoot. 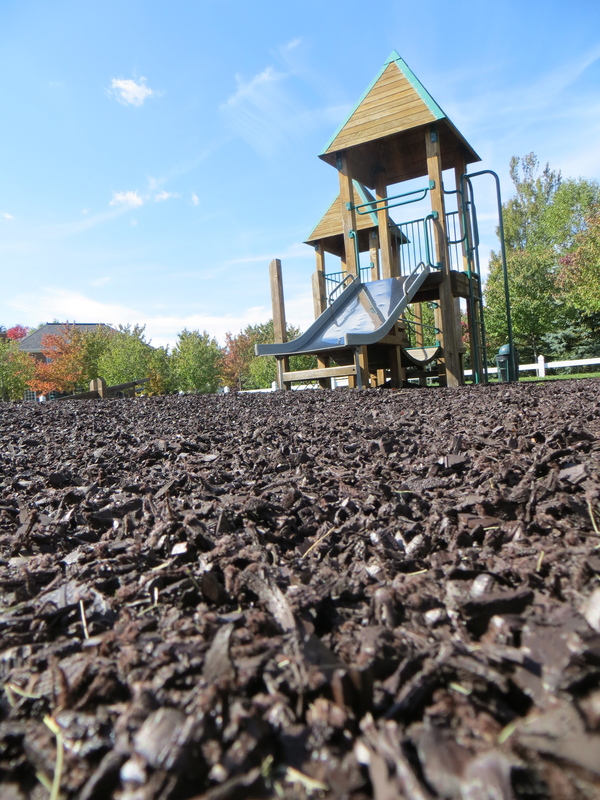 The black shards of shredded tire look good on the playground — like high-end mulch, but without the odor — and I have to believe that the rubbery surface is much safer than cement or asphalt (the preferred surface in the death trap playgrounds of my childhood) or wood chips, which was the immediately preceding surface. The rubber shards are an inch or two deep, and when you walk across them you feel like any kid toppling off the teeter-totter and falling onto the springy surface would be likely to bound three feet in the air.